New role: Archbishop Mark Coleridge is the new president of the Australian Catholic Bishops Conference. Photo: ACBC. 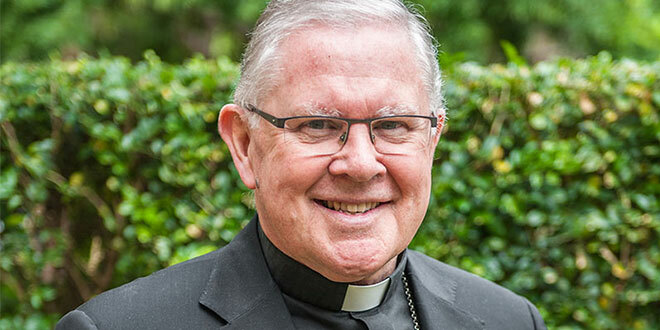 BRISBANE Archbishop Mark Coleridge says he will be “working to make sure Jesus is at the heart of everything” as he prepares to lead Australia’s Catholics through the sexual abuse crisis and the upcoming historic plenary council. “This will mean helping the Church find a distinctively Gospel voice in the great social debates – not fighting ideology with ideology, but engaging issues with the power of the Gospel,” Archbishop Coleridge said. He was elected president of the Australian Catholic Bishops Conference, the permanent collegial assembly of the bishops of Australia, during a biannual plenary meeting on May 4. “Throughout history, the great surges of Gospel energy have come when things looked grim. That’s where we are now,” Archbishop Coleridge said. “The great opportunity we have is to open ourselves to the power of God in our weakness and allow God to build a new and unexpected future for us. In a Church scarred by revelations during the Royal Commission into child sexual abuse, Archbishop Coleridge said the first task was reconciliation with survivors. “In a sense, they will have to lead the Church beyond the horrors of abuse,” he said. “Then we need to repent, which is not just saying sorry, but working to ensure that the Church is genuinely safe and caring, so that trust is rebuilt. “We also need to ask what it was in Church culture that allowed abuse to happen and to be so grossly mishandled by Church leaders, and to change the culture wherever necessary. “Much has already been done, but there’s a long journey ahead of us. As he assumed the presidency for a two-year term, Archbishop Coleridge said the Plenary Council 2020 offered an opportunity for Church renewal. “The Spirit is asking us to listen in deeper ways – to God and to each other,” he said. “The plenary council isn’t a talkfest; it’s a time to discern, decide and act. Archbishop Coleridge was ordained Auxiliary Bishop of Melbourne in 2002 and later became Archbishop of Canberra-Goulburn. Since 2012, he has served as Archbishop of Brisbane. He said a range of experiences was perhaps a factor in why his brother bishops chose him as president. “As a bishop, I’ve been a rolling stone for quite a long time; I’ve seen the Church in Australia from south to north, from city to country,” Archbishop Coleridge said. Archbishop Coleridge said Pope Francis was fundamental in renewing the Gospel call. “He’s been a gift of the Holy Spirit. That’s why he’s intimately part of our Spirit journey, even if he’s far away,” he said. “He models the episcopal ministry in new ways, speaking a language that people get – even people outside the Church. Archbishop Coleridge succeeds Archbishop Denis Hart, who completed six years serving as president of the conference. Sydney Archbishop Anthony Fisher was elected vice-president of the bishops’ conference.